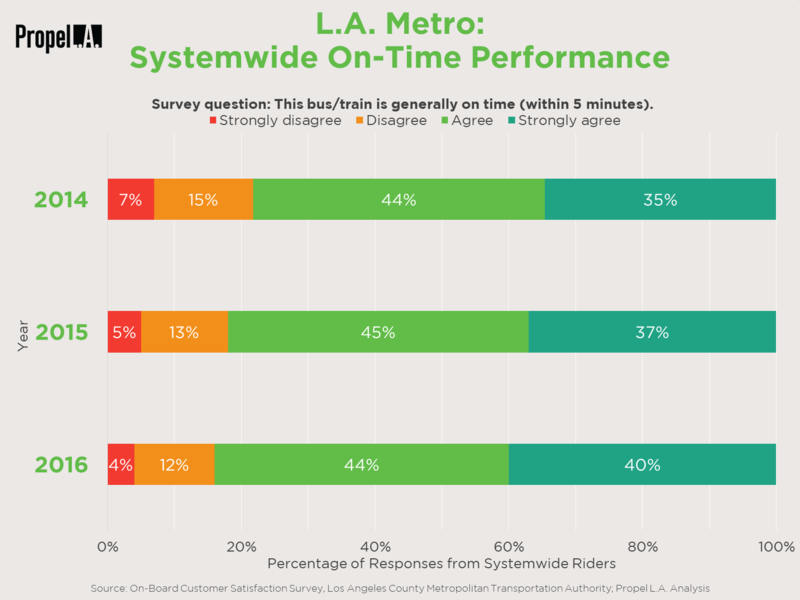 L.A. Metro Systemwide On-Time Performance | Propel L.A.
An example of the published results of the L.A. Metro On-Board Customer Satisfaction Survey. This one is from 2016. The results of the annual L.A. Metro (Los Angeles County Metropolitan Transportation Authority) On-Board Customer Satisfaction Surveys reveal an improvement in on-time performance every year since 2014. L.A. Metro surveyed customers on whether or not they agree that the bus or train they ride generally arrive on time, specifically defined as within five minutes. The respondents overall agree with the statement by 79% in 2014, 82% in 2015, and 84% in 2016. The results suggest that L.A. Metro has generally improved their on-time performance over the years but do not identify specific tardy outliers.